Hot on the heels of the mid-range 7X, Honor has unveiled its flagship offering, the "View Series" and the V10. On paper, the Honor View 10 will look very similar to many of you as it's essentially a rebadged Mate 10 Pro from Honor's sister-brand Huawei (which we gave 5-stars in our review). That means you'll get the Mate 10 Pro's edge-to-edge 5.99-inch display, with a 18:9 aspect ratio and FullHD resolution. That's pretty impressive for a phone of this price (which we'll get onto later). You'll also get the blazing fast Kirin 970 chipset with Huawei's Neural Processing Unit, 6GB RAM and 128GB storage. The phone supports expandable storage and features a USB-C and 3.5mm headphone jack. The Honor View 10 has a familiar dual-camera setup, with a colour 16MP sensor and monochrome 20MP sensor. Just like the Mate 10 Pro, the Honor camera relies heavily on AI to identify what you're taking a picture of, and adjust the image to take the best quality possible. Honor View 10 diverges from the Mate 10 Pro with a slightly different design. It features a metal back (available in Navy Blue and Midnight Black), rather than glass. The battery is slightly smaller (3,750mAh vs 4,000mAh), but the View 10 still features fast charging, to quickly replenish battery life. It measures just 6.97mm thick, and the fingerprint sensor has been squeezed underneath the screen. The View 10 will use the 13MP front facing camera for facial unlock. It's unlikely to be as advanced as the iPhone X's system, but it's nice to have options. 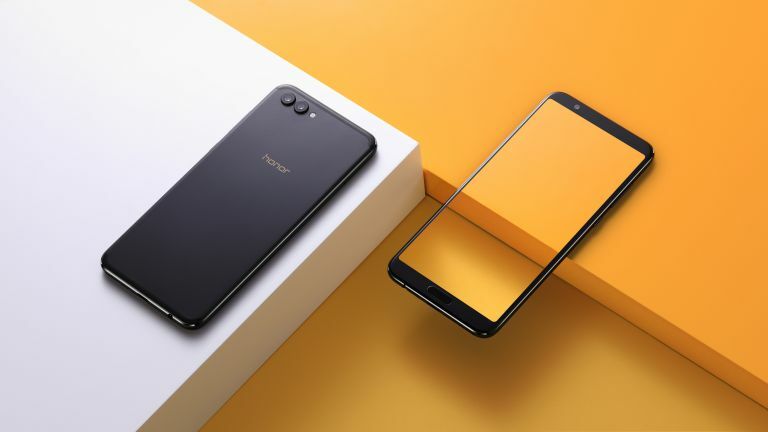 It looks like a neat package, and despite it's affordable price, Honor have always impressed us with its build quality. It's even more impressive that the Honor View 10 is priced at a very affordable £449.99 (for comparison, the Mate 10 Pro is priced at £699). It'll be available on January 8th.